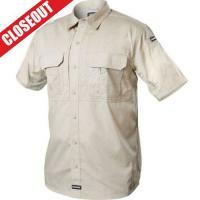 The BLACKHAWK!® Pursuit Short Sleeve Shirt combines durability and breathability with strength and style. The ripstop fabric is coated with weather-resistant Teflon® Shield+ capable of repelling oil, water and stains while resisting tears and cuts. Gusseted underarms keep you moving freely and a vented back yoke provides excellent breathability. Triple needle stitching and bar tacks deliver reinforcement needed under stressful wear and tear and multi-purpose pockets, including 2 hidden document pockets, provide room for all the extras.